In a break with recent history, Pennsylvania Gov.-elect Tom Wolf’s transition will be financed with private donations, not tax dollars. A spokesman said the transition team will not need the $250,000 estimated by the state budget secretary to cover office costs. Instead, private donations will be accepted and disclosed on the Wolf’s transition website by inauguration day, Jan. 20. Late donations will be disclosed 30 days after the fact, said spokesman Jeff Sheridan. 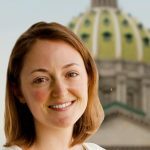 “Gov.-elect Wolf doesn’t want to burden taxpayers with this process,” said Sheridan, adding that the team isn’t ready to disclose patrons’ names yet. Wolf spoke with reporters briefly Thursday after having what he called his first meeting with the steering committee of his transition team. Transition chair John Fry, president of Drexel University, said the next several weeks will be spent examining state agencies and getting a handle on the fiscal situation. “There will be … committees underneath us, from a steering committee standpoint, that will be focused on departments and agencies, and so we’re going to have many hundreds of people involved,” Fry said. Wolf said he isn’t ready to name anyone to his cabinet yet, but he’s not ruling out keeping some current secretaries at state agencies. “It’s certainly not off the table,” said Wolf. Some of his cabinet nominees might come from the transition team itself. The governor-elect plans to name the rest of the team in the next 10 days. Specialized committees will have to review each state agency and share their findings with Wolf by the time he takes office.